Please note that the content of this book primarily consists of articles available from Wikipedia or other free sources online. 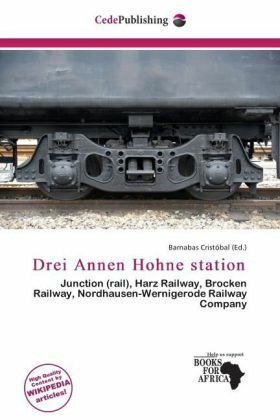 Drei Annen Hohne station is a branch-off station on the Harz Railway and the Brocken Railway. The station was built in 1898 by the Nordhausen-Wernigerode Railway Company after the completion of the Harz Railway and initially bore the name Signalfichte, then Signalfichte-Hohne. After a storm blew down the Signalfichte in October 1901, the names of two hamlets in the vicinity were joined together to make the new station name.